The above picture of Clare is the wallpaper I’m currently using. My last wallpaper below. The lovely Hirano Aya was my wallpaper for Feb. Loved it. anonymous, which one are u refering to? clare or hirano aya? what resolutionare u using? No no…I’m a new poster. I’ve been a reader for a while but this is the first time I’m motivated to post >_< The clare one? I’m using 1440×900. anonymous, i only have it in 1920 x 1200. here u go. I recently has a XP-tan wallie, but since I got a group project with powerpoint presentation next week, I have changed it into an image with a neat optical illusion, a girl (dunno who she is) and the following message: “There is no Tsukihime anime”. Great when you want to be sleepy or be on a trip without more or less illicit substances or practices (especially one I will NOT be talking about. LOL). Zyg`, kinda same for me as well, whenever i download or save something. i’ll dump it on the desktop too. but will clear them up if they get too many. 4Chan /w/ is another good place for anime wallpapers. 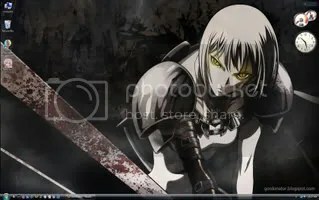 You can find more of Claire’s from there if you request a thread of her or of Claymore, Anon. Assuming they do not bash you outright, you should get more than a thread’s worth of her wallpapers in different resolutions. On topic, this month’s wallpaper is Elwing, the Shining Tears X Wind one. The one where they have her full name and her princess title, green background. Taka Tony’s character designs and drawings are made of win.